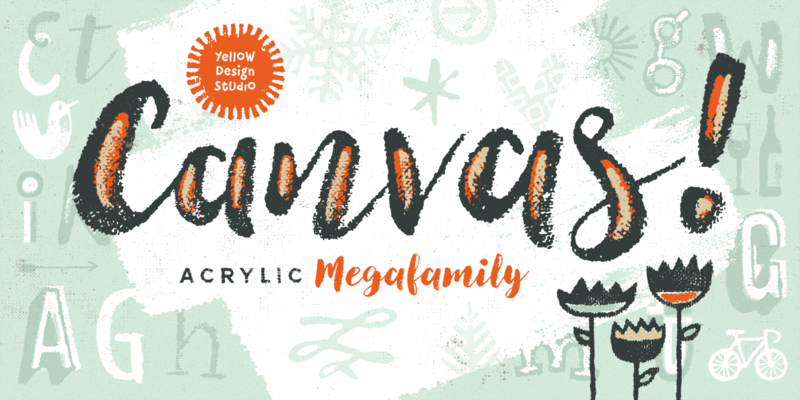 The Canvas Acrylic Megafamily from Yellow Design Studio is a collection of nine distinct hand-painted font families ranging from refreshingly festive to folky and organic. Six of the families include unique layering options for added dimension and impact. With authentic, hi-res texture the fonts maintain their realism even at very large sizes. The entire suite has double-letter ligatures that automatically fix adjacent duplicates letters. A bonus set of vector background textures, shapes and elements is included for free!